Lush Fab Glam Inspired Lifestyle For The Modern Woman: Lux Travel Essentials and Stylish Travel Gear. 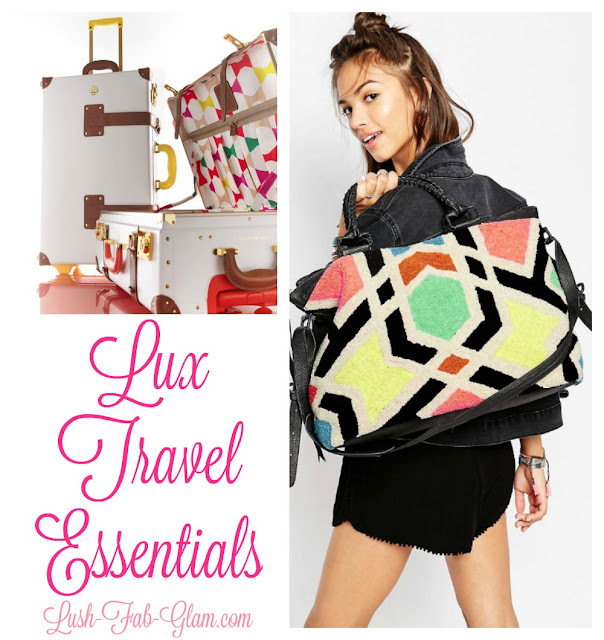 Lux Travel Essentials and Stylish Travel Gear. Wanderlust: Lux Travel Essentials & Stylish Travel Gear. Summer time equals sunny days and travel adventures whether it's quick a weekend retreat, a week long getaway or fun summer long explorations. Since we love sharing our favorite dream destinations and wanderlust travel bucket lists with you, we thought, why not help you get ready for your own travel adventures in style! Our favorite travel gears are carry-on bags with wheels and weekender bags, they make for no hassle travelling, eliminate the risk of lost luggage and are comfortable to carry around while changing flights. Whatever makes traveling easier and saves us the stress associated with airport runs is ok in our book. Plus it never hurts to have stylish travel gear like the ones below featured in the photos we snap during our travel adventures. Fab Tip: Click on the images of the travel bags below for more photos and product details. What items are on your must-have list when traveling? Share with us by leaving a comment below.